Starring: Selton Mello, Paulo José, Larissa Manuela, Giselle Motta, Teuda Bara. Brazil’s political system looked like a bit of a three-ring circus when a clown was elected to Congress in 2010. Grumpy, aka Francisco Oliveira Silva, reportedly took over 1.3 million votes—nearly double the tally received by the runner up—and rode the clown car all the way to public office. Grumpy made quite a farce of his campaign, running with signs and a YouTube campaign that read, “It can’t get any worse.” Grumpy, regardless of all his shenanigans, inadvertently showed what a clown could contribute to society thanks to his ability to make people laugh through stupid, selfless humour. The production of Selton Mello’s The Clown, which opens the CFI’s 17th annual Latin American Film Festival this Thursday, predates Grumpy’s hijinks, but it offers another tale from Brazil about a clown finding his place in the world by having the last laugh. The film, Brazil’s submission for Best Foreign Language Film in the most recent Oscar race, offers a warm, upbeat opener to the festival. 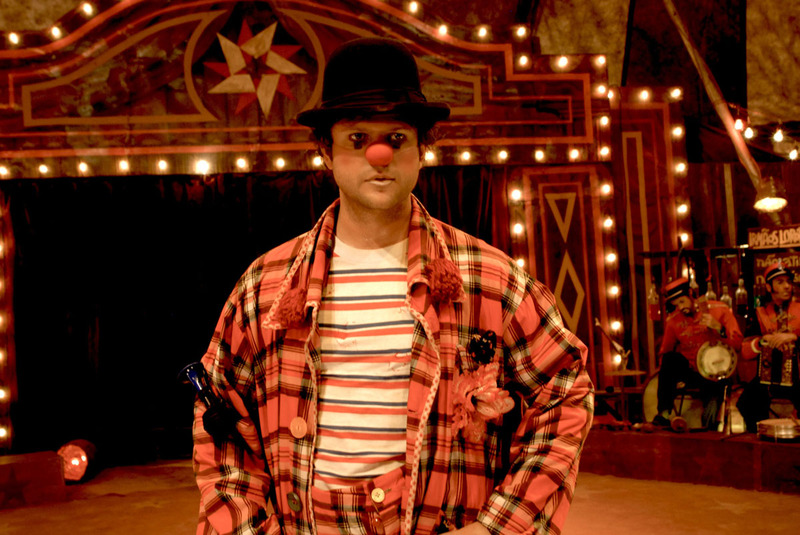 Mello—who directed and co-wrote the film—stars as Benjamin, a life-long performer who works as a clown in his father’s circus. Hamming it up under the alias of Mongrel, Benjamin joins his father, alias Thoroughbred, in making people laugh night after night. Mello introduces the clown as a born performer. Going over the usual script with his father, and then farting and riffing before the crowd during the show, Benjamin seems to love providing relief for the famers. Benjamin, however, is one of those sad and depressed clowns that seem to be a fixture of international art cinema. He smiles only when performing. It’s odd than Benjamin is a clown with a frown when he brings so much laughter to others. His circus even notes the irony of his situation, as it provides escapism to the masses under the banner of Circa Esperança, which translates as Circus of Hope. There’s little hope for Benjamin as he dreams of a life of smiles and chuckles, but then spends most of his time being dogged by shady politicians and needy comrades. The Clown makes a transformative journey out of Benjamin’s personal struggles with materialism, economic hardship, and other peoples’ definition of success. Benjamin’s desire, strangely, is embodied in a dream of earning an electric fan for his tent. The idea is put in his head by a curvaceous co-worker, who makes the off-collar remark as Benjamin puts on his camouflage before the show and make-up rolls down his face in sweaty dribbles. Marked by a desire to have something physical to denote his success, Benjamin is blind to the wealth of camaraderie at Circa Esperança. Benjamin’s father tries to woo him with some strange advice. Thoroughbred repeats to his son several times, “Cats drink milk, mice eat cheese, and I’m a clown.” Thoroughbred’s advice makes little sense, since cats are lactose intolerant and mice shouldn’t each such fatty food. The father, in a way, solicits the kind of mentality that acts as his son’s downfall: Benjamin has an idea of how things should be, but he lacks a sense of how things really are. 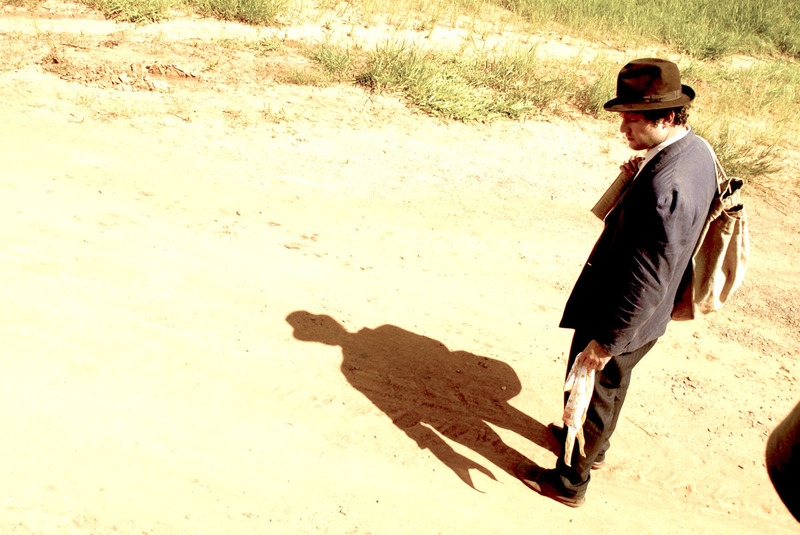 The Clown offers a series of episodic moments in which Benjamin travels the countryside and tries to reconcile his own ambitions with society’s expectations. Sometimes with friends, sometimes alone, Benjamin’s wanderings allow him to encounter all sorts of working class citizens in the rural villages through which the circus travels—The Clown never sees the sunny beaches of Rio. Throughout Benjamin’s odyssey, he is watched over by the circus’s smallest performer, Guilhermina (Larissa Manuela). Guilhermina, an orphan, loves Benjamin’s charade and she watches his performance as Mongrel with a child’s wide-eyed innocence. Benjamin sees his protégé as a younger version of himself that is uncorrupted by the pesky cravings of objects and desire. (Guilhermina’s performances tend to focus on spiritual pleasures.) Benjamin perhaps sees in Guilhermina a version of his own idealism and early love for the circus (mice and cheese, as his father would say), and The Clown offers an unabashedly feel good tale as the clown looks into the child’s eyes and sees the nobility in being a performer. Some of The Clown’s recitals and road-trips are a bit too on the nose with how they inject a George Bailey-ish attempt to turn the clown’s frown upside-down, and many of the circus’s performances are so bizarrely nationalistic that one can’t help but notice the modesty of the morale. The thinness of the subtext, however, usually makes its subjects look like simpletons. Mello’s staging of the film is often awkward, as performers appear in random placements within the shot, often remaining fixed in place as if they’re unsure what to do—although one expects a film to be awkward if it’s about a humourist who can’t laugh at his own jokes. Mello lets the troupe laugh and enjoy their poverty, though, so The Clown provides an amusing, if slight, look at how one learns to define success through family and friends, rather than through money and material wealth. Moviegoers hoping that this trip to Brazil might bring a return to City of God could find themselves a bit disappointed, but The Clown is a sedated, celebratory offering voiced in the pared-down minimalism that led many to find an appetite for Brazilian cinema in the first place. My former Brazilian film prof is surely grinning ear-to-ear thanks to the film’s down-to-earth characterization of this diverse nation. While I struggled to share such an appreciation for the aesthetics of hunger during my twelve-week immersion in Brazilian cinema, I couldn’t help but crack a smile during The Clown’s droll, humble journey. Brought to life by a rousingly carnivalesque score and a warm sepia-tinged lensing, The Clown is a notable comedy from a country whose international success tend to offer darkness and destitution. The Clown does justice to the provincials Benjamin entertains, for as Mello tours the circus around Brazil’s rural regions, the film gives a light-hearted and humble hat tip to Brazil’s working class. If a clown can rise to public office, he can surely find pleasure in bringing smiles to the faces of his friends and neighbours. The Clown opens the Canadian Film Institute's Latin American Film Festival on Thursday, March 21 at 7:00 pm in the auditorium of Library and Archives Canada.